A new research paper entitled “A Framework to Integrate Social Media and Authoritative Data for Disaster Relief Detection and Distribution Optimization“ has been published in the International Journal of Disaster Risk Reduction. In this paper, the BDEM researchers propose an interdisciplinary approach to (natural) disaster relief management. Our framework combines dynamic and static databases, which consist of social media and authoritative data of an afflicted region, respectively, to model rescue demand during a disaster situation. Using Global Particle Swarm Optimization and Mixed-Integer Linear Programming, we then determine the optimal amount and locations of temporal rescue centers. Furthermore, our disaster relief system identifies an efficient distribution of supplies between hospitals and rescue centers and rescue demand points. By leveraging the temporal dimension of the social media data, our framework manages to iteratively optimize the disaster relief distribution. It is a joint work of Timothy Schempp (CICS, San Diego State University), Haoran Zhang (The University of Tokyo), Alexander Schmidt (Uni Hohenheim), Minsung Hong and Rajendra Akerkar (Vestlandsforsking). Full article can be found at the journal website. 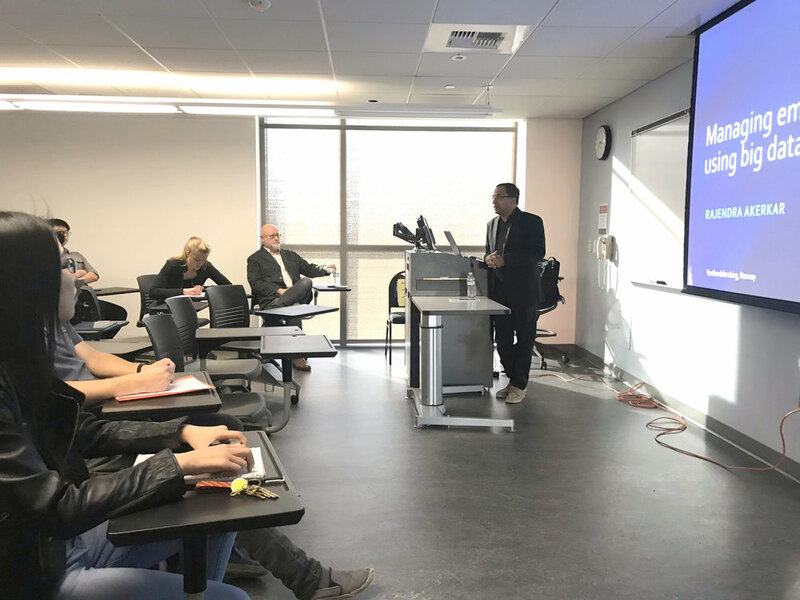 On 8th February, the BDEM coordinator Professor Rajendra Akerkar delivered a colloquium at the Department of Geography, San Diego State University, USA. The topic of this colloquium was “Managing Emergency Situations Using Big Data – A Perspective”. With the advent of Internet of things, social media, wearable devices, mobile phones, and planetary-scale sensing there is an ample opportunity to transform big geo-spatial data into actionable information. The talk focused on emergency management which is fundamentally a spatio-temporally distributed heterogeneous data assimilation problem for situation detection. Professor Akerkar illustrated examples from related projects in his research group and presented key challenges for managing big emergency data. The colloquium attended by students, researchers and faculty members of the Department. SDSU’s The Center for Information Convergence and Strategy (CICS) is one of the partners in BDEM project. The Center is active in diverse domains, such as disaster response, global security, threat reduction, business development, biomedicine, public health, and the digital humanities. It emphasizes data acquisition and analytics, social media solutions, strategic mapping, data mining, and systems integration and development. From visualization to machine learning and predictive analytics, CICS leverages information technology to evaluate current trends and develop strategies based on dynamically evolving content. Dr. Minsung Hong (Western Norway Research Institute) and Dr. Haoran Zhang (the University of Tokyo) participated in the 5th International Conference on Information and Communication Technologies for Disaster Management (ICT-DM 2018) in Sendai, Japan, in 4-7 December, 2018 to disseminate results of the BDEM project. They have presented one paper and poster at the conference. This paper outlines our ongoing efforts at building an effective disaster relief system utilizing real-time, crowdsourced responses to disaster events. This system integrates three components: social media analysis, rescue demand prediction, and relief distribution optimization. We introduce the conceptual disaster relief system, database structure, and its integrated components. Finally, a summarization of the current research challenges we expect to address in the future is provided. Dr. Haoran Zhang (the University of Tokyo) presenting a paper at the ICT-DM2018. This poster paper outlines an ongoing research that aims to incorporate semantically enabled Big Data processing for emergency response . The ultimate aim is to create an integrated platform to support prediction, early alerts, transmission and routing of the emergency data, aggregated analysis of multimodal data and coordination between emergency stakeholders (e.g. first responders, the authorities, volunteers). The modelling and computing challenges associated with such platform can be organised in terms of the 5 Vs of Big Data, which provides a means to organise our research efforts in addressing Big Data challenges using semantics. The conference also provided the opportunity to discuss upcoming research themes in data-driven emergency management with the BDEM project members in Japan, in particular, Professor Ji (National Institute of Informatics, Japan) and with other prominent international researchers who attended the conference.